SpaceClaim customers can easily launch their 3D designs directly into KeyShot from within SpaceClaim for groundbreaking photorealistic results. It's simply the fastest and most intelligent way to create a precise photorealistic image and is the preferred rendering option for SpaceClaim customers. Designers and engineers who need to see what a product will look like before it actually exists must create images that are precise, in digital format, 3D, and photorealistic. KeyShot software renders the topology created in SpaceClaim to deliver a final product that is the object itself, not just a picture of it. This product puts the power and functionality of large and expensive systems in the hands of individuals for the first time. In addition, it empowers 2D users to move to 3D modeling while continuing to work in a familiar environment, without having to become "geometry experts." SpaceClaim is pleased to offer several KeyShot options to ensure our customers get the level of rendering necessary. Contact your SpaceClaim sales representative for the KeyShot options available to you. 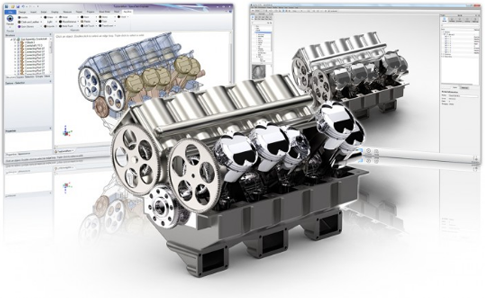 SpaceClaim customers can easily launch their 3D designs directly into Luxion's KeyShot for groundbreaking photorealistic results.